Remember the joy of being able to play your favorite classic arcade game at home for the first time? What system did you have? Atari 2600? Intellivision? NES? What gameroom would be complete without at least one console gaming system? That’s what we asked ourselves, which is why we’ve added an entire room devoted to classic console gaming at the Southern-Fried Gameroom Expo this June! 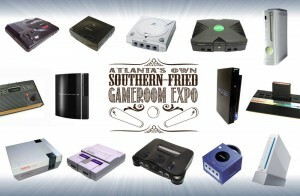 Get your thumbs ready to enjoy such classic consoles as Magnavox Odyssey, Atari 7800, Super Nintendo, and more! Each game system will be connected to it’s own vintage CRT TV monitor for that retro feel, while some of the newer systems will be projected onto the wall for some high-stakes competitive gaming (Can you say “Super Smash Bros.?!”). If you’re looking to fill out your collection for your favorite console, be sure to check out one of our newest vendors, The Video Game Trader, who will be running a few of the console tournaments throughout the weekend! Want to see if your favorite system will be there? Check out the list of confirmed systems on our website and let us know any recommendations you have for your must-play console games!